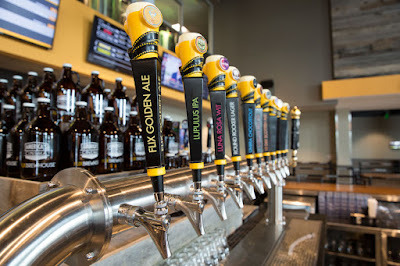 Flix location in Carmel, Indiana (courtesy of Flix Brewhouse). 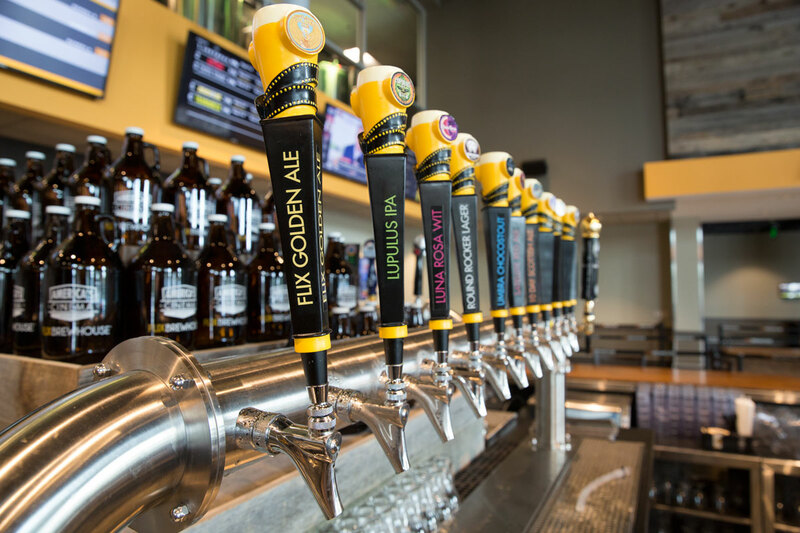 With Friday's announcement that Flix Brewhouse will be opening an outpost in Little Elm, North Texans may be wondering what the new place will have to offer in terms of its beer program. So, in order to find out, I got in touch with Greg Johnson, director of sales and marketing for the firm, who provided a rundown of what to expect. Naturally, given that Flix will have four other locations1 by the time the Little Elm theater opens in spring 2017, the primary question on many people's minds has to do with how unique the beer offerings might be here locally. While the company does have a standard set of year-round and seasonal recipes that are made at each location, Johnson indicated that each brewpub still has a personality all its own. will be incorporated in the exterior of the Little Elm location (courtesy of Flix Brewhouse). "We have six core beers that each location brews and carries 365 days a year," Johnson says, "along with six national seasonals that all locations produce annually. One of those seasonals is Saison de Walt, which honors the memory of co-founder Walt Powell, who had been working to help push the Flix brand forward prior to his untimely passing in 2013. We also have what we call our 'Gentleman Series,' which consists of four-to-six hop forward beers (i.e. The Imperial Gentleman IPA) that we brew and tap at each location." way that allows patrons to observe work going on in the physical brewery (courtesy of Flix Brewhouse). "After that," he explains, "each local brewer has the freedom to create in their market, so this means they concept and create as many as 18-20 full batch brews annually with the guidance of our brewery council. Of course, each brewer also has their own style when it comes to their barrel aging program. In Round Rock, we do lots of barrel-aged sour beers, since that's our Round Rock brewer's passion. In Iowa, we see more aging with rum, bourbon and cognac barrels. As for Little Elm, we won't know how that plays out until we have 'our guy' in North Texas, but whatever it is we will support their passion." On that note, being as it's still early in the development process (with a lease signed, Flix is now involved in designing the architecture of the space), a local head brewer for Little Elm has yet to be hired. Based on current timelines, Johnson believes Flix will begin the search to fill that position sometime in the fall. Once hired, the plan is for the Little Elm locale to be up and running with a full slate of the brewpub's core beers and national seasonals on opening day. 1. Flix currently operates theatres in Carmel, Indiana, and Des Moines, Iowa, in addition to the original in Round Rock, Texas. A location in Albuquerque, New Mexico, is expected to open later in 2016.